Our intention for the weekend was to climb the Santanoni Range (aka The Santas). Our plan was to hike in and up the Panther Brook trail, as it is farther away than the Santa Express, pop over to Panther, slog it to Couch, book it over to Santa, and then down. Knowing it would be a long day and an early start, we stayed in nearby Newcomb at a newly renovated B&B, The Hoot Owl. It’s a 20 minute drive to the Santas trailhead, and the B&B is very comfortable – the owners told us to help ourselves to anything in the fridge for breakfast, seeing as we would miss the meal as we were leaving early for our hike. Before I detail the trip let me just say: Couch gets a bad rap. I think people hate it because it’s a lot farther than people think it is. It took us 3 hours (not counting our break at the summit.) to get there and back. 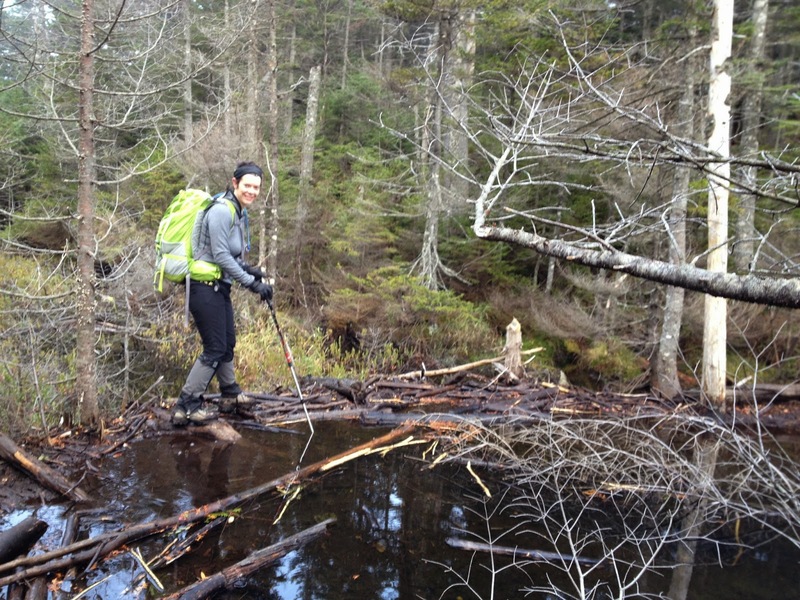 But – it’s a pleasant hike, the mud isn’t bad (it was worse on Panther), and the bog is easy to get across – there were lots of logs and branches to step on to easily clear it. Just be prepared for it to be a long hike there. Turn around and head back. The trail will be on your left about 30 seconds later. By this point it was light, and we put our headlamps away. 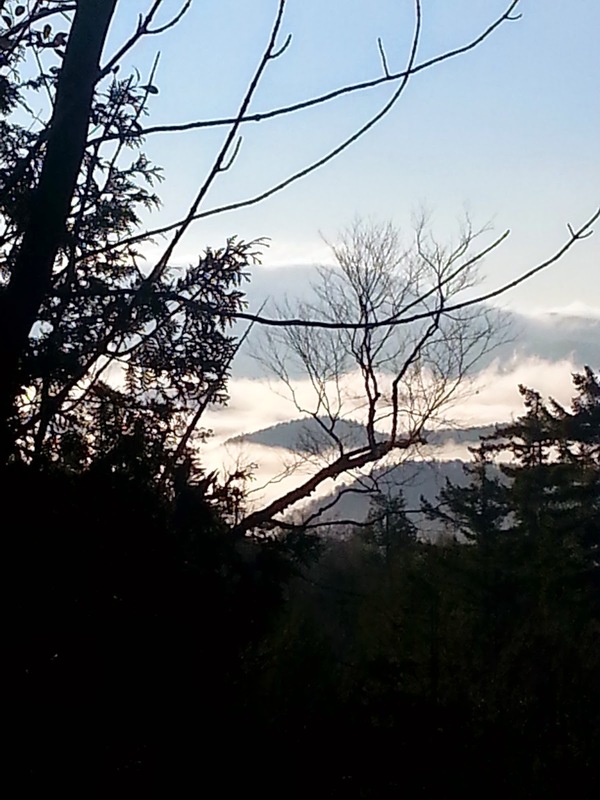 The fog was lifting as the sun burned it off, resulting is some great views from the trail. 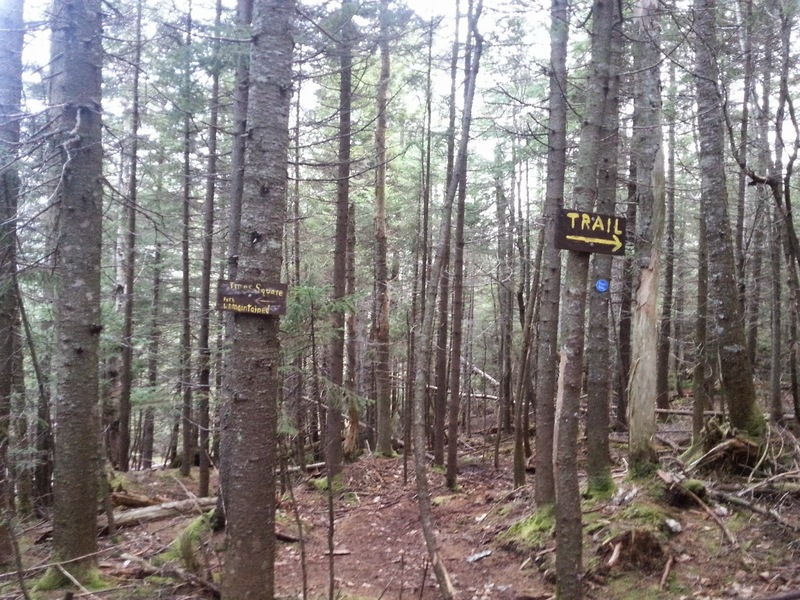 The Bradley Pond trail is a relatively smooth trail, especially at the beginning. Shortly after starting it, you come to a small water crossing, where a bridge has been….washed away? Destroyed at any rate. There were two planks set across the water, resting on rocks, that we walked across. The water level wasn’t high that day, so rock hopping would also have been an option. Not long after that is the “Dangerous Bridge” crossing – the planks that form the bridge itself and in good repair, it is part of the side of the bridge, leading to ground level, that have fallen away. We rock hopped the crossing in the morning, but by evening the water level had risen considerably, so we shimmied around the dangerous part of the bridge, and hauled ourselves onto the bridge and walked across. It held, but here’s hoping it’s replaced/fixed soon. Shortly after the dangerous bridge, the trail get wet, and muddy. There were enough rocks to rock hop around the water, but gaiters were definitely a good piece of equipment for this hike. We hit the cairn marking the turn off for the Santa Express two hours after starting our hike, and about an hour after starting the Bradley Pond Trail. As we walked the trail became rockier and wetter the further on we walked, and we passed three sets of rotting corduroy wood bridges before we hit the junction with the Panther Brook herd path. Judging from some other blogs I’ve read, our path wasn’t as wet as it can be. It was just a trickle of water at most points This junction is not too far from the Santa Express – we got there a half hour after we saw the cairn marking the Express. We took a quick break, taking off a layer as it had warmed up a bit, and then started off towards Panther. Careful on the beaver dam. Just after the junction, you leave the trees and come out onto Bradley Pond. Here, you walk across a beaver dam (was the beaver named Bradley? Is that how the pond got its name?) being careful, as the spit of land is rapidly eroding into the water. Once across the dam, you enter the trees again and start an upward climb. We did find that the trail here was a little hard to follow – there seemed to be some false herd paths in the area, going off in all directions. Perhaps in the summer it’s easier, the fallen leaves at this time of year can obscure trails easily. 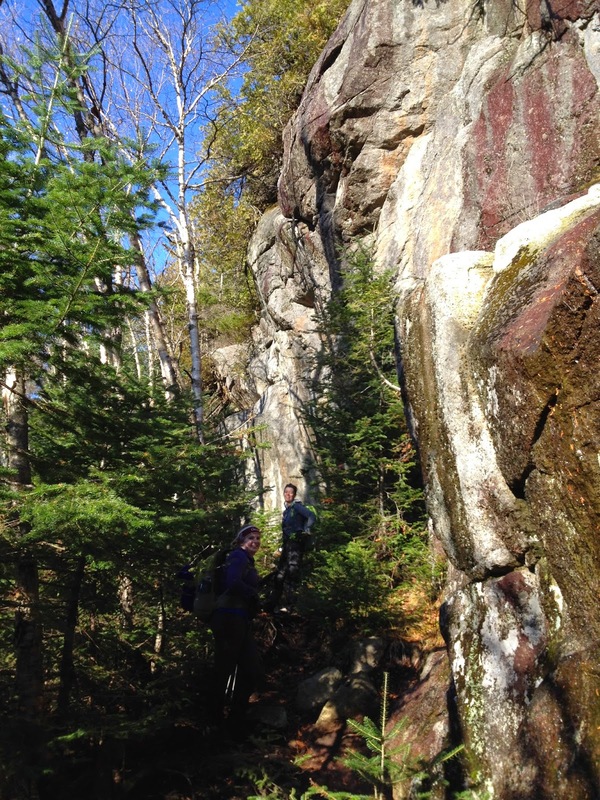 With a bit of searching, we found the correct trail – slightly wider than the others, and bit muddier, and we were off, climbing at a moderate grade. There’s a bit of up and down, although the rocks aren’t too bad yet, before you come to a set of impressive cliffs. We walked along the base of them, making a joke about “Thankfully there’s no paint blazes” when what do we see? Paint blazes. (Granted, the paint blazes were telling us to follow the trail we were on.) After the cliffs we came to Panther Brook, which you have to cross – there’s a small cairn on the other side. The water level was low enough that we just walked across the rock slabs. From there on out, you follow the brook up. A lot of times you are in the brook – walking up the rocks. 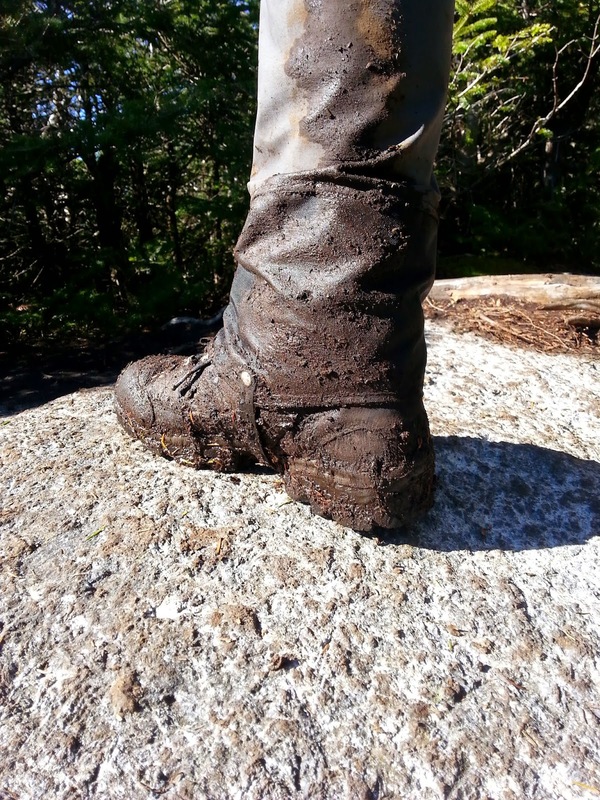 We were lucky that the water level was low, and our boots didn’t get wet, although they did get muddy fairly quickly. There was another false lead, where it looked like the path led away from the brook, but we quickly figured out our mistake and continued up the rocks. Eventually the brook peters out, and the trail continues, muddy, through the trees until…..it ends. You come to a T junction with another trail. This is Herald Square. If you turn to your left, you’ll see a ‘P’ carved on a rock, marking the trail to Panther. 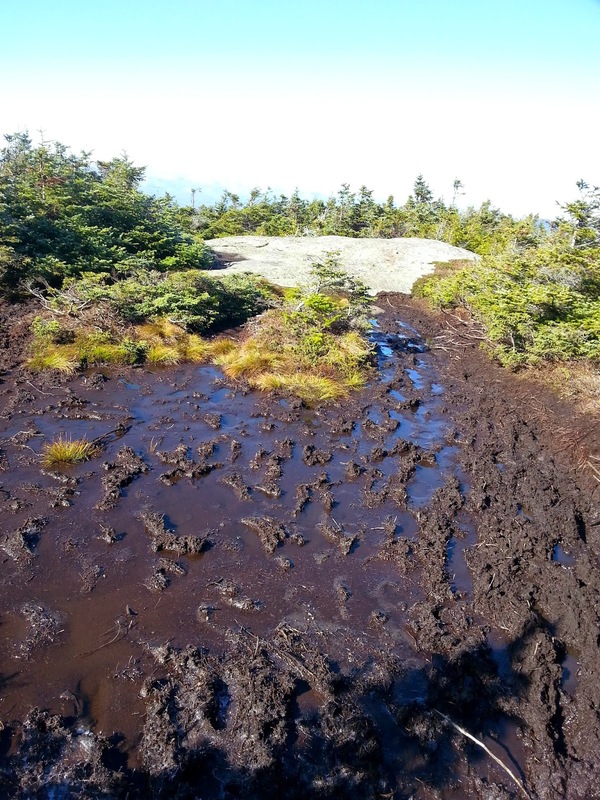 Just then we saw it – the giant muddy bog of doom, and just beyond the safety of a rock slab. We first headed along the left side, which was shortest, but got instantly sucked into the mud. 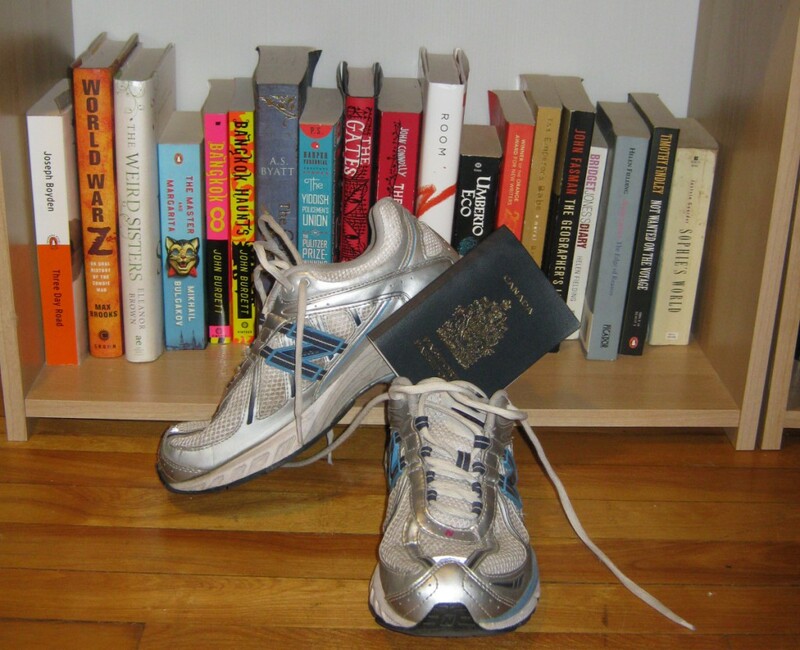 (And yet again I was thankful for my gaiters.) 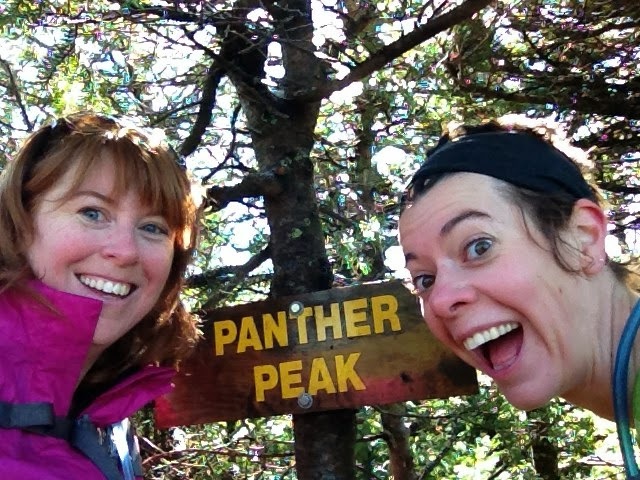 We reached the rock slab, gawking at the view, before racing in another few feet to take a photo with the summit sign. Then it was back out to take in the view from Panther, which is phenomenal. We didn’t stay long, knowing that we still had to hit Couch. We walked back through the bog, staying to the opposite side, which wasn’t as boot sucking as the other, and headed past Herald Square to Times Square, where we arrived at 11:28, 5 1/2 hours after starting out. From there we followed the ‘C’ carved into a tree towards Couch, running into four or five other groups also heading in the same direction, which would make for one crowded summit. The trail to Couch wasn’t that bad – there were a few mud patches at the beginning, but then the trail dried up, and it was a pleasant hike through the woods. There were three significant down-and-up sections – just when you think “Ahhhh, the summit must be close, I’ve probably gone down the 800′ and now this is the 300′ up” but no. The third time this happens, then you’re close. The infamous Couch bog is slightly past the mid-way point, closer to the summit than Times Square, but not exactly all that close. 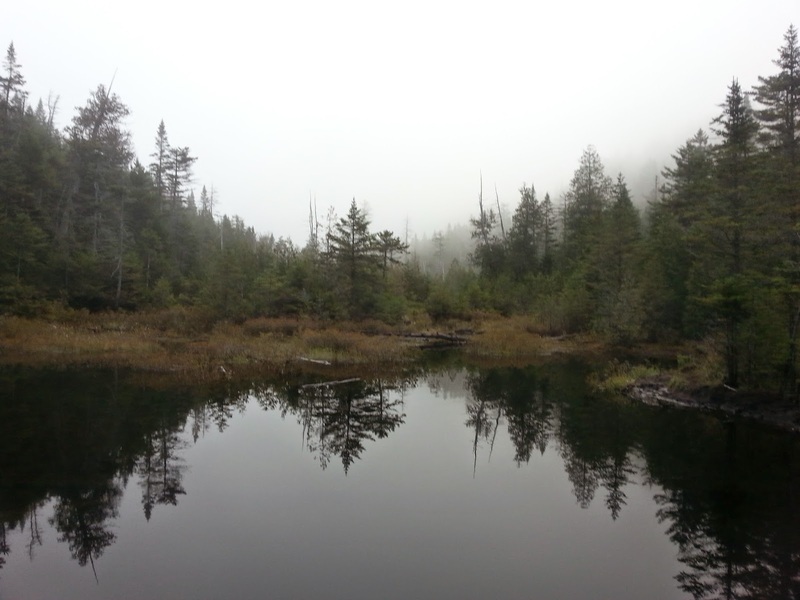 It’s also not all that bad – we found plenty of logs and branches to walk on across the bog. That doesn’t mean that we didn’t step into the bog, but thankfully the two times I did (once on the way to there, and once on the way back) it was near the end. I only got sucked in upto my ankles. Near the summit of Couch are two rock scrambles, one of which was wet as I went through. I was wearing gloves, because so many of the logs, trees, rocks and branches were wet, so I just hauled myself up. After the second rock scramble (mini-cliff), you’re at the summit. 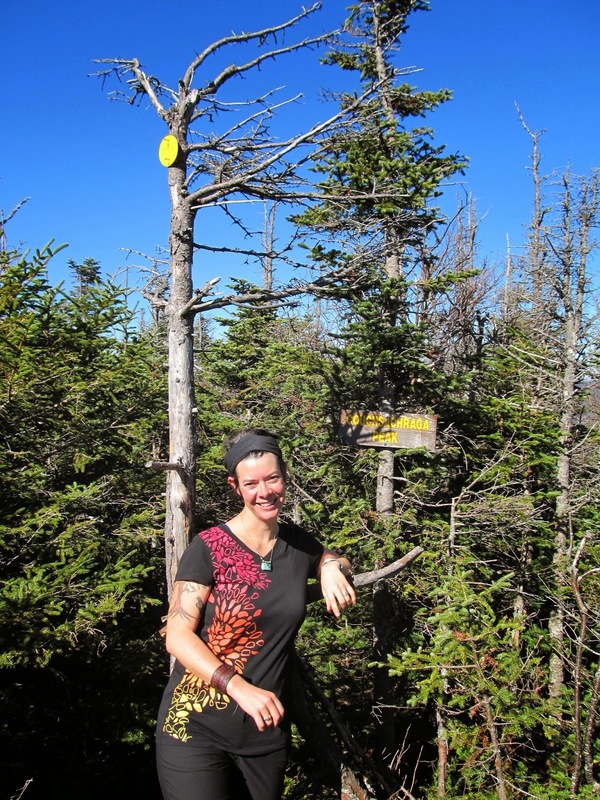 (If you’re on the trail and begin wondering if you’ve passed the summit, the trail ends at there. If there is trail in front of you, you haven’t missed it.) Everyone we met said the same thing, “That was a lot further than I expected.” Couch may be little, but the amount of work to get there is not. It’s 1.4 miles from Times Square to the summit, and going back you have to gain a lot of lost elevation. Most reports I’ve read said that on the way to Couch you lose 800′ only to gain 300′ to reach the summit – don’t forget the reverse of that! That’s 800′ you have to re-gain on your way back. Our trip back to Time Square was a bit slower, as we were starting to get tired, and the constant sucking of the mud added to the amount of effort we had to put into each step. By the time we all got back, it was 2:47, giving us a total time of 3 hours 29 minutes to get to Couch, have lunch and get back. We debated the wisdom of doing Santa – it’s a mile along the ridge, with 400′ elevation gain, to the summit, and then two miles down the Express. From the Express trail junction, it would be another 2 hours, and one dangerous bridge crossing, to get back to the car – we figured on this taking us at least 5 hours. 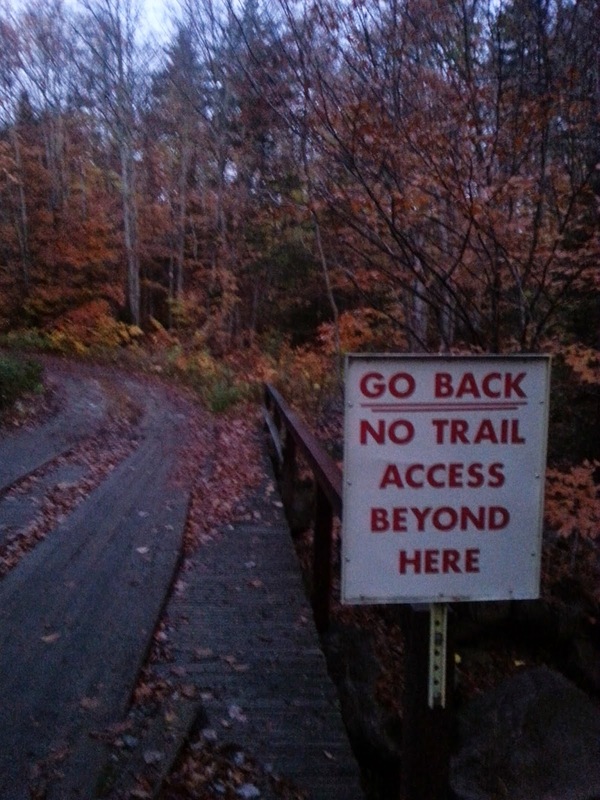 On the other hand, if we were to take the Panther Brook trail, we would be on the trail for only 4 hours, assuming it didn’t take us as long to go down as it did up. We knew that the sun would be setting at 6:30, so we made the decision to leave Santa for another day. We headed back down the way we came, finding it even wetter than on the way up. 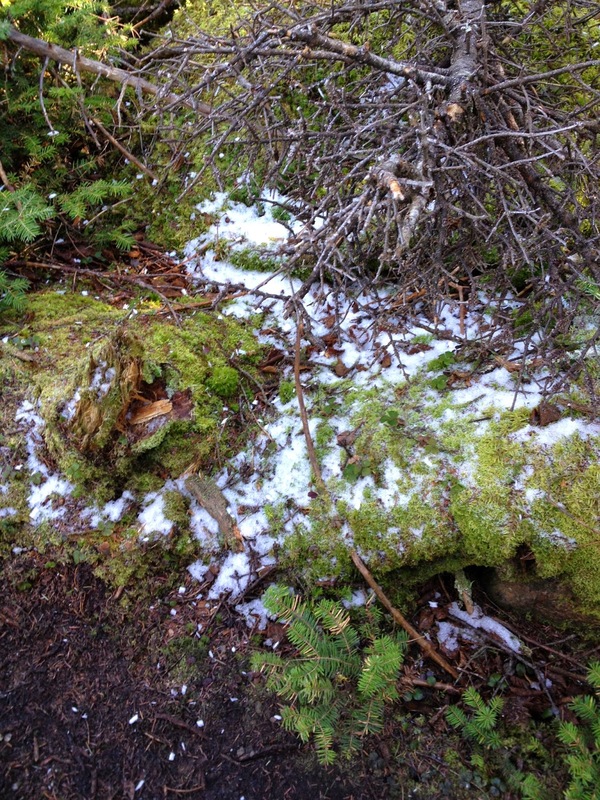 We assumed it was due to snow melt, as it had been a bright, sunny, warm day on the trails. We moved a little quicker on the down, although not by much, as finding footing was difficult on the rocks – going up streams is always easier than going down, because going down you can’t see what’s below the rocks as well. However, we shaved nearly a half hour off our time, arriving at the junction with the Bradley Pond trail at 5:00. Steph’s ankle started hurting (from a previous injury), and the other girl’s asthma starting to kick in, so we decided that I would go ahead to the cars and get things (i.e. food and water for after the hike) organized, while the two of them would go at a slower pace. I headed out, crossing the dangerous bridge this time, as the water level had risen enough to make rock hopping harder, and onto the road for 6:00. Having down the hike in in the dark, I didn’t recognize many things along the way. I hit the parking lot at 6:35, with just enough daylight left to change into non-mud encrusted clothing. After that it was just a patient (if slightly paranoid “all alone in the dark and was that a sound? Did I see something other there? ARE THE DOORS LOCKED?! ?”) wait for the other two to arrive. I figured on them being out by 7:30; I saw their headlamps at 7:20. – Couch is a pleasant hike when you know that it will take forever.